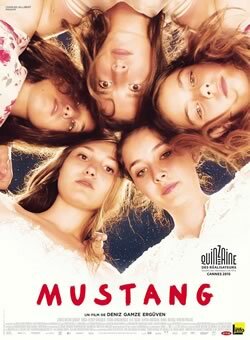 Nominated for an Academy Award in the Best Foreign Language Film category, Mustang takes place in a Turkish coastal village on the Black Sea. Celebrating the last day of school before summer holidays, several children play in the sea. In their school uniforms, they give piggy back rides and splash each other. When a neighbour woman sees what’s going on, she reports the five girls and their scandalous behavior to their grandmother and uncle, guardians of the sisters since the death of their parents. The sisters are punished and all “instruments of corruption,” such as cell phones and computers, are taken away. They’re forced to wear shapeless brown dresses and bars are installed on the windows. The girls are instructed in homemaking and marriages start to be arranged. As the older sisters are subjected to virginity tests, then married off one by one, the younger sisters resolve to avoid the same fate. Their love of freedom and each other empowers them to rebel and determine their own futures.